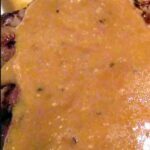 Black Peppercorn Sauce, Sauce au Poivre is a lovely accompaniment to steak, easy and quick to make too! 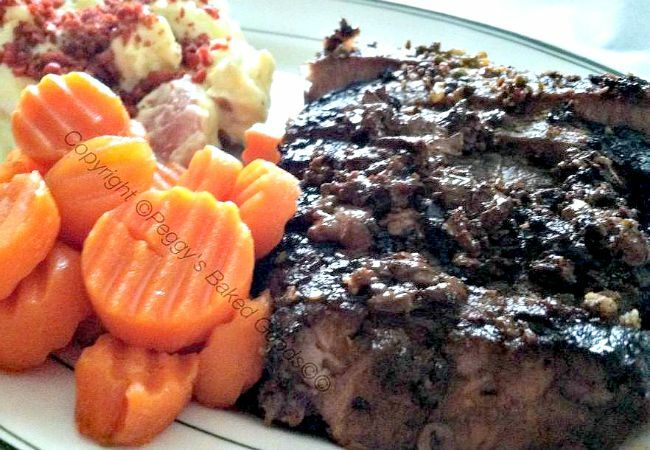 Black Peppercorn Sauce or Sauce au Poivre you’d like to use the fancy name is absolutely wonderful. It’s rich and creamy with a luxurious taste. This sauce only takes a matter of minutes to make. Depending on how much of a sauce fan you are, you may want to double up the recipe. 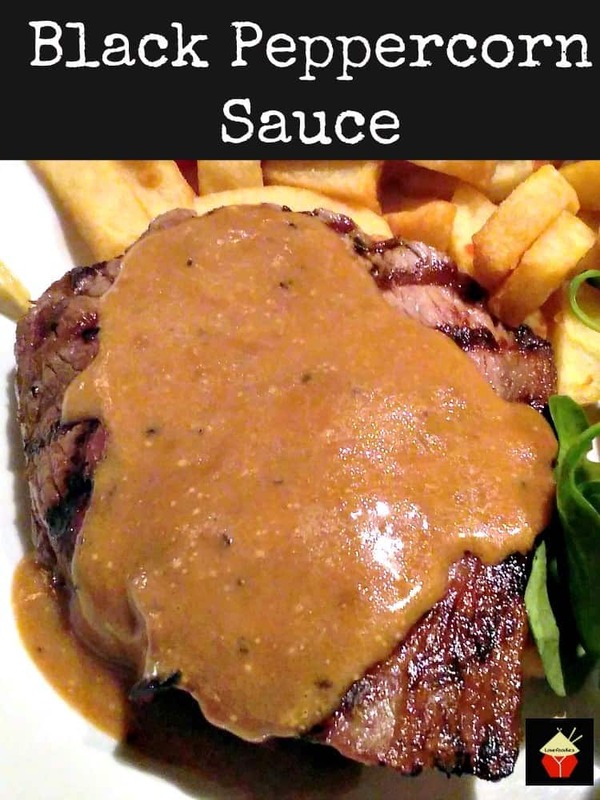 I know some people like to have the sauce smothered over their steaks and others like just a little sauce. You decide what suits you most. 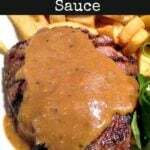 It’s a classic combination to have Black Peppercorn Sauce with steak, but you know, this sauce also goes very nicely with pork and chicken too. 2. In a saucepan over medium heat add the butter and melt. Then add the shallot and saute until soft. Then add the peppercorns. Add the brandy and bring to the boil. Then add the beef stock and bring back up to boiling. 3. Once boiling, turn the heat down to low and add the cream and stir. Allow to gently heat through completely without boiling. (boiling may cause the sauce to split). 4. Continue to heat the sauce gently until it is the thickness you wish. Between 5 – 10 minutes. Taste the sauce and add salt if desired. 5. When ready, serve in a sauce jug or pour directly over your cooked steaks. 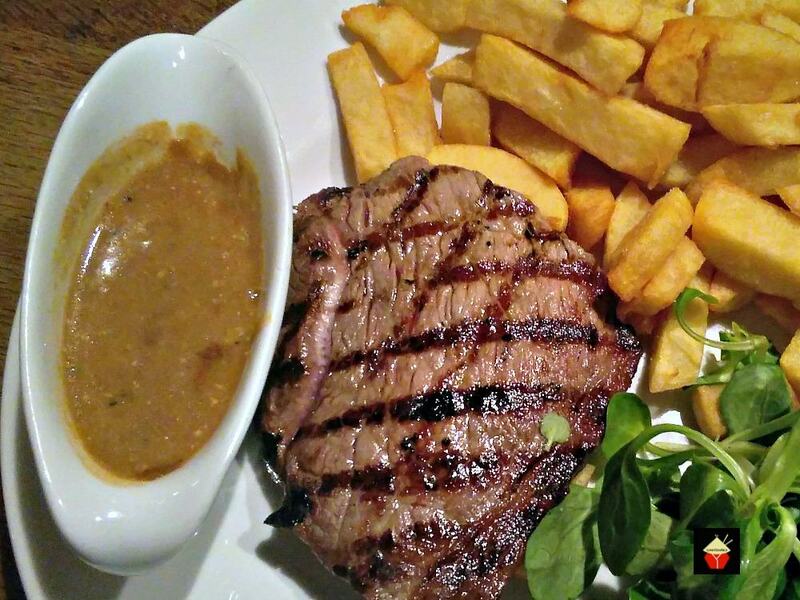 If you’d like a lovely recipe for Pan fried steak, take a look here. In a saucepan over medium heat add the butter and melt. Then add the shallot and saute until soft. Then add the peppercorns. Add the brandy and bring to the boil. Then add the beef stock and bring back up to boiling. Once boiling, turn the heat down to low and add the cream and stir. Allow to gently heat through completely without boiling. (boiling may cause the sauce to split). Continue to heat the sauce gently until it is the thickness you wish. Between 5 - 10 minutes. Taste the sauce and add salt if desired. When ready, serve in a sauce jug or pour directly over your cooked steaks. What would be a good substitute for the Brandy, for someone who would prefer not to use alcohol? Hi Calvin, you can leave the brandy out, I can’t think of a substitute which would give you the same flavour, but you could try adding a splash of balsamic vinegar to it to give it some acidity. Not sure when the peppercorns need to be added! Just added at the brandy/stock stage? Are you meant to let the alcohol burn of or not? Hi Carina, I’ve just updated the recipe for the peppercorns. For some reason it was left out so thanks for spotting that! They go in after you’ve softened the shallot. For the alcohol, it burns off when it is brought to the boil (step 2).